Dynatrace automatically derives tags from your Kubernetes/OpenShift labels. This enables you to automatically organize and filter all your monitored Kubernetes/OpenShift application components. It&apos;s recommended that you define additional metadata at the deployed system. For Kubernetes-based applications, you can simply use Kubernetes annotations. Dynatrace automatically detects and retrieves all Kubernetes and OpenShift annotations. This enables you to use automated tagging rules, based on existing or custom metadata, to define your filter sets for charts, alerting, and more. These tags and rules can be changed and adapted any time and will apply almost immediately without any change to the monitored environment or applications. 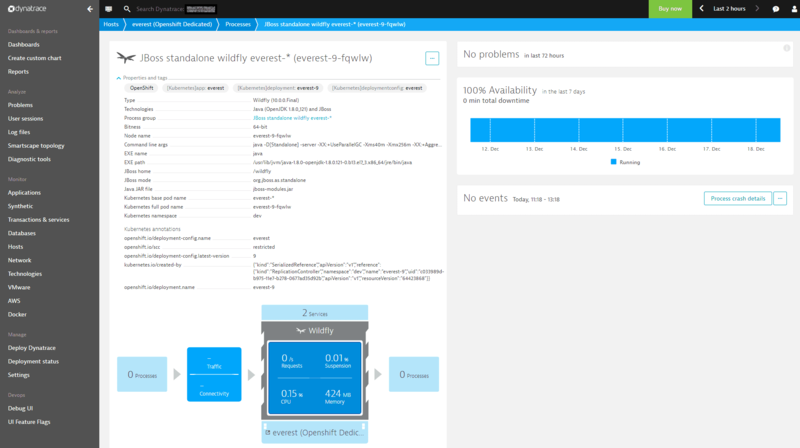 Dynatrace detects Kubernetes properties and annotations. Such properties and annotations can be used when specifying automated rule-based tags. Kubernetes base pod name: User-provided name of the pod the container belongs to. Kubernetes container: Name of the container that runs the process. Kubernetes full pod name: Full name of the pod the container belongs to. Kubernetes namespace: Namespace to which the containerized process is assigned. Kubernetes pod UID: Unique ID of the related pod. Kubernetes-based tags are searchable via Dynatrace search. This allows you to easily find and inspect the monitoring results of related processes running in your Kubernetes or OpenShift environment. You can also leverage Kubernetes tags to set up fine-grained alerting profiles. Kubernetes tags also integrate perfectly with Dynatrace filters. You can specify OpenShift labels in the Pod object definition of your application or you can update the labels of your OpenShift resources using the command oc label. Dynatrace automatically detects all labels attached to pods at application deployment time. All you have to do is grant sufficient privileges to the pods that allow for reading of the metadata from the OpenShift REST API endpoint. In this way, the OneAgent code modules can read these labels directly from the pod. In OpenShift, every pod is associated with a service account that&apos;s used to authenticate the pod&apos;s requests to the OpenShift API. If not otherwise specified, the pod uses the default service account of its OpenShift project. Each OpenShift project has its own set of service accounts and thus also its own project-scoped default service account. The labels of every pod, whose service account has view permissions, will be imported to Dynatrace automatically. The following steps show you how you can add view privileges to the default service account in the project1 project. You&apos;ll need to repeat these steps for all service accounts and projects you want to enable for Dynatrace. Alternatively, OpenShift also allows you to add view permissions to all service accounts in a project.